Dives and Rich Guy. They go together like a Charlie Sheen and good taste. You see, Rich Guy doesn't prefer restaurants that are "unclassy". He'd rather drive around in the Crystal Mall parking lot for hours rather than eating at a place like Burger Burger. That is indeed a real commitment to avoid places that Guy Fieri deems as "money". Call it what you want, but I'm sure he's #winning, much like Charlie Sheen (well, that's a bad example, scratch that...). So imagine my utter amazement and confusion when he recommended a place that is not only a dive, it's totally hidden from plain view as well. So let's get this straight. Rich Guy wants me to try this restaurant that has no ambiance whatsoever which employs disposable plastic table coverings as it's only decor. I never thought I would see the day. What's next? A trip down to Prime Time Chicken??? So where is this place? 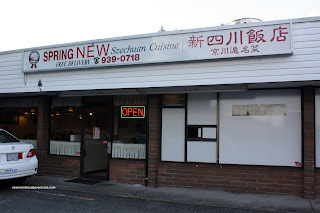 Well, it used to be called Spring Chilli Szechuan; but it was bought out and now goes by the name of New Szechuan Restaurant. 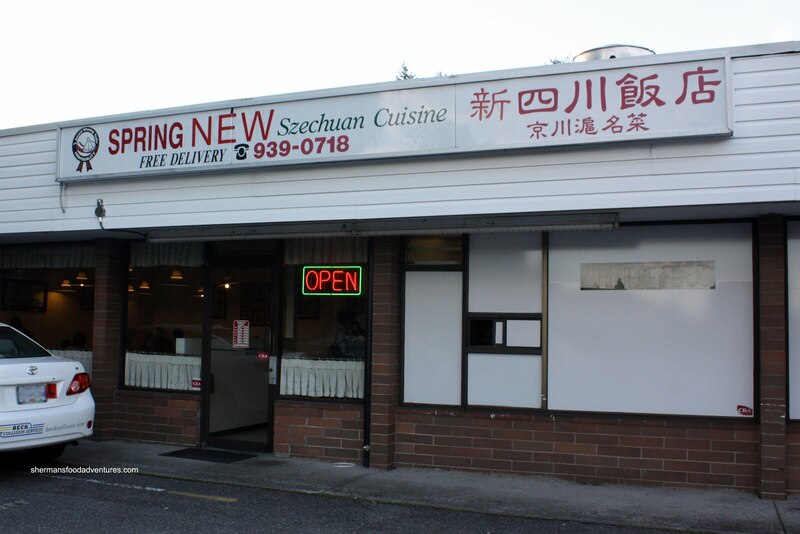 Yah, not very creative; however, it is Szechuan and "new". For a "secret" restaurant as Rich Guy put it, the place was packed when we arrived. I guess there are no secrets when it comes to food! I also made it no secret to my son that the food could be quite spicy - something that would ultimately bite my in the arse... 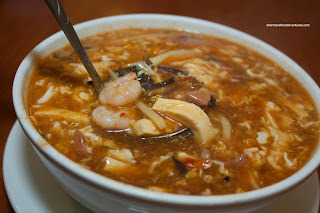 So we started with the Hot & Sour Soup (which was really cheap for $6.95). In terms of depth, we thought it was a little weak; but there was sufficient tartness and spice. There was also plenty of ingredients which included a decent amount of shrimp. For me at least, I like my hot & sour soup with meat. It gives the soup more body. Overall, a decent hot & sour soup for the price. 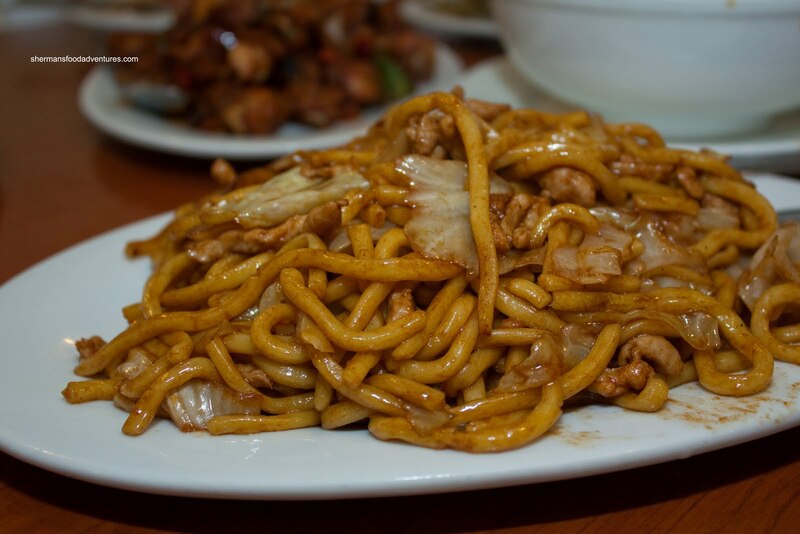 According to Rich Guy, this restaurant does one dish really well which keeps him coming back over and over. Now, for him to make this claim, it really has to be good. The dish in question is the Chili Garlic Pork. 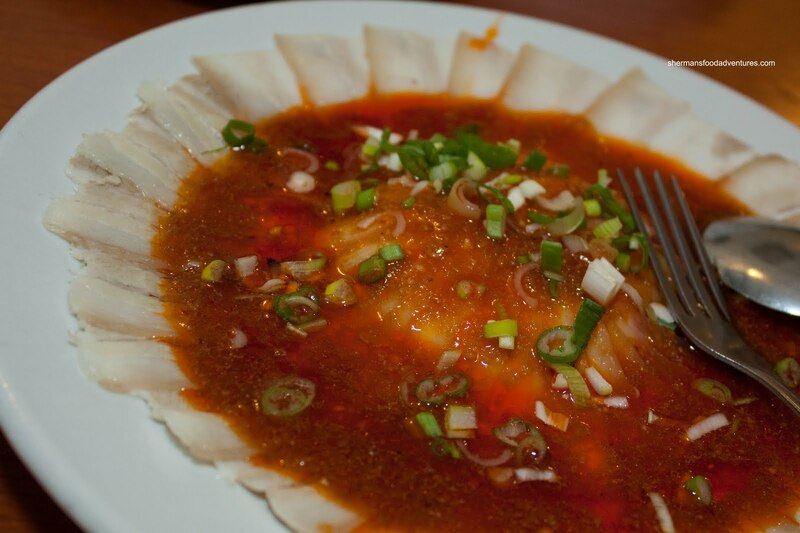 Consisting of thinly sliced pork belly smothered by minced garlic, ginger and doused with chili oil, this was a veritable flavour explosion. Combined with the naturally melt-in-your-mouth pork, I absolutely agree that this is good. 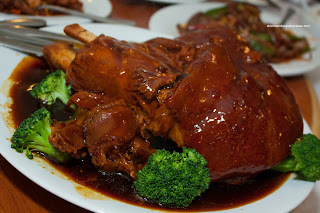 In fact, we could've ordered 4 of these; however, we had many more dishes coming. It's really too bad the next dish was a complete let-down. The Chili Green Beans were completely overcooked. Let me rephrase that, they were completely over-fried. 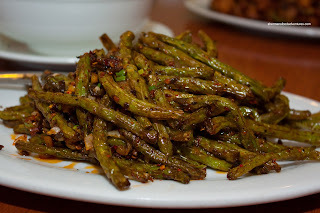 Deep-frying the beans prior to stir-frying is a typical restaurant preparation for this dish. These were fried to the point that they lost all their colour and texture. They were dry and limp at the same time. The one saving-grace was the spicy savouriness of the flavouring agents. Interestingly, the next dish to arrive was something we did not recognize. 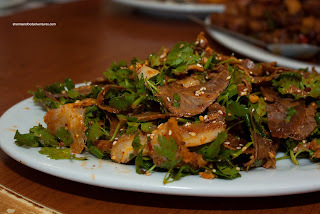 It turned out to be the Sliced Beef Shank and Tripe. 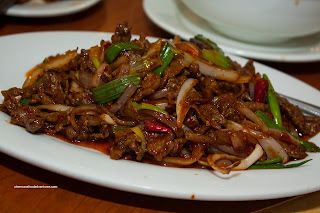 Although we did not order this dish, I secretly wanted to since it is quite obvious I have this affinity for offal. 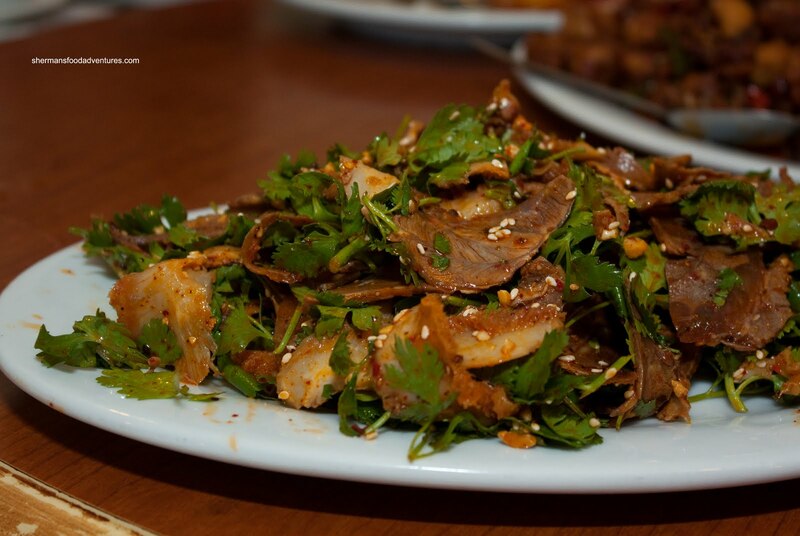 Buried beneath the obscene amount of cilantro was thinly-sliced braised beef shank and honey comb tripe. Everything was tossed in a dressing of chili oil, vinegar, sugar and soy. Although it can be seen as a simple item, the flavours and textures worked. I enjoyed this dish very much (since nobody else really touched it). Another dish I enjoyed flavour-wise didn't really come through in overall execution. 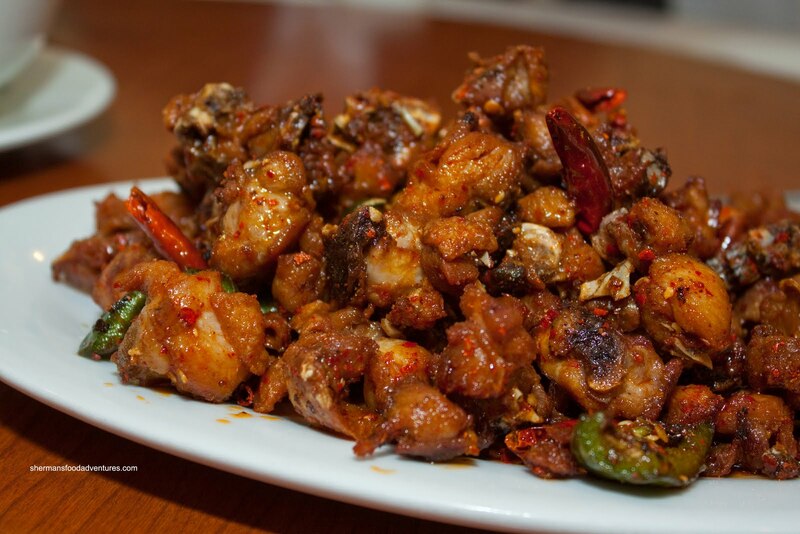 The Dry Szechuan Chicken had a nice chili oil kick (much like everything else); but was cut up into pieces which were far too small. Once fried, most of the pieces were too dry to actually eat. Combined with the bones, it became somewhat hazardous if you were not careful. - Lots of parking! Yay!